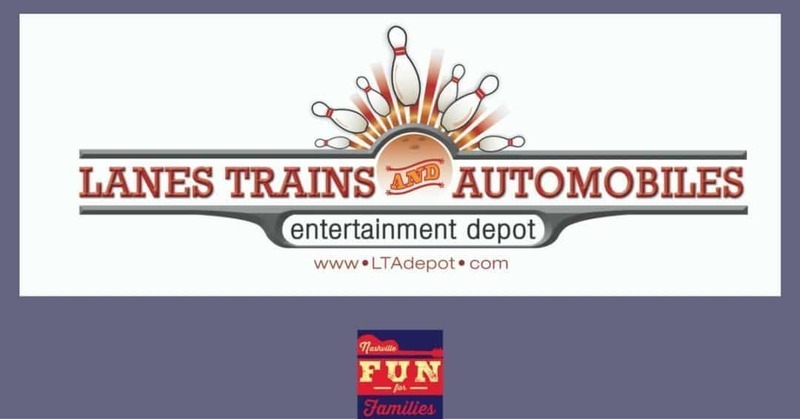 Lanes Trains & Automobiles (hereafter referred to as LT&A) is a family fun center located in Murfreesboro, TN. When you walk through the front door, you will pass through the game area first. Just keep walking until you see the information desk on your left. This is where you will purchase your bowling, wristbands or game cards. The bowling area is clean and modern. There are 24 lanes for bowling. Each set of 2 lanes has seating for up to 8 people. There are lots of balls available in different sizes and we had no problem finding lighter weight ones. The staff was very helpful in getting my kids set up with the right size shoes and ball. The shoes were clean and well maintained. ‘Helpers” for small children and bumpers are available. Located on the back side of the bowling area you will find the Pro Shop. You can purchase balls, shoes and bowling accessories here. This spot is also home to the 4 party rooms at LT&A. This link has all the information on planning a party at the center. Back toward the entrance to LT&A is the Lazer Station. Up to 16 people can play a game of laser tag in this 2,500 square foot space. Laser Tag is open to all ages but players must be at least 42 inches tall. Throughout LT&A you will find arcade style games. Instead of tokens or quarters LT&A uses the ‘Depot Dollar Card”. This card can be purchased at the self service kiosks. Once you load them, they can be used for game play throughout the center. There are also lots of tables and places to sit and relax. I found a nice spot to read while my kids played games. The Dollar Depot Card also keeps track of your winnings as an ‘e-ticket”. If you have ever followed your child through a place like this loaded down with tokens and paper tickets, you will really appreciate the freedom of this card. Once play time is over, just take the card to the redemption area to trade for prizes. If you or your kids are fans of bumper cars, don’t miss out on the Spin Zone. The bumper cars are tucked into a corner in the arcade area. If you get hungry, LT&A features a restaurant called ‘Tailgaters’. There is seating inside or you can order your food and eat it at a table near the games or bowling area. Tailgaters has karaoke, VIP bowling lanes and big screen tvs throughout the restaurant for sports viewing. Lanes Trains and Automobiles offers lots of specials for affordable fun including daily deals and wristbands for unlimited fun. They also participate in the Kids Bowl Free program so be sure to register every summer.